Trade shows have long been a valuable forum for B2B marketers. From one industry to the next, trade shows, like most scheduled events, follow a predictable pattern. From the marketer’s point of view, that pattern starts with the arrival of a qualified audience and ends with the capture of sales leads and some associated data. As B2B marketers follow the lead of their B2C peers and shift more dollars to digital, it’s not surprising to see a lot of emphasis on ideas like geo-fencing. 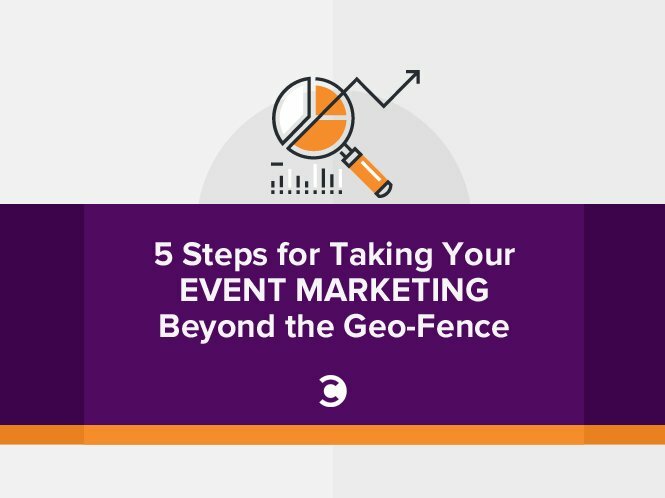 After all, a geo-fence not only creates a boundary around the attending audience, but it allows marketers to initiate a data-driven process inside that fence as well. But a geo-fence isn’t a strategy; it’s a tool. So, let’s forget about the geo-fence for a moment (we will revisit this later), and instead focus on the larger objective. One reason B2B marketers are so attracted to events and trade shows is that we can learn a great deal about our customers in the context of their extended geographic location. A person at a financial services trade show most likely works in the financial services industry; likewise, a person at a baseball game can be assumed to be a baseball fan. However, while a single location reference provides limited data about the audience, the top five most frequently visited locations create an entirely new level of audience context. Your professional association doesn’t end when you leave the trade show, but when you add in other locations, a clearer, more accurate picture emerges. In our new mobile culture, we take our identity with us from one location to the next because in a sense, we are where we locate ourselves. The challenge for B2B marketers isn’t so much targeting people at a specific event. Rather, it’s identifying your audience as they move from a trade event to the office, to home, to a store-front, and even online. The process of building an audience profile has a lot in common with the idea of the virtuous circle: a concept that refers to a complex chain of events that reinforce themselves through a positive feedback loop. Because it’s a circle, you can start anywhere, building on the assets you have to grow new assets and capabilities as you go. So, while the following appears in list form, think of it as a process that can begin wherever you have a data point to leverage. A decade ago, when Apple unveiled the very first iPhone, only the earliest of early adopters could be counted on to have smartphones. The world has changed. Today, virtually all Americans have cell phones, and the overwhelming majority (77 percent) of cellphone owners have smartphones, according to the most recent data from Pew. As a practical matter, the shift toward mobile means that device IDs have replaced cookies as the universal targeting key. For B2B marketers, the universal ID is the DNA of the virtuous circle. By identifying a device (information that can be obtained through a CRM customer list, collection at a trade event, visits to a storefront, or an online site visit), marketers can branch out and match the device to active IP addresses because we take our phones with us wherever we go. The result is that the marketer can build a powerful link between a person and the company they work for. But, as any student of the virtuous circle knows, that link is only as powerful as the data you’re able to add to it. When we think about an event like a trade show, it’s not hard to identify a structure that the marketer can leverage to create context. In fact, these touchpoints are typically laid out for both marketers and attendees in the form of a show schedule. Speeches and panel discussions usually precede workshops and breakout sessions on specific topics. The days are dedicated to exhibits on the show floor, while the evenings are reserved for mixers. All trade shows have a beginning, middle and end. But these patterns aren’t limited to trade shows. Just as a trade show represents a good opportunity to collect relevant device IDs, having those IDs before the show may give you a jump start on discovering meaningful patterns. The key is that each touchpoint gives the marketer an opportunity to assign context to each signal. While you may once have been limited to the trade show proper, touchpoints built on devices can expand to include CRM data, website actions, time spent at the airport on the way to the show, or a location like a nearby restaurant where you know many of the patrons are show attendees. In effect, the marketer is using the device signal to create their own segmentation scheme for messaging based on an audience’s demonstrated interests and alignment to specific opportunities. Just about every business today has access to analytics from their website, and all businesses can beef up that information by purchasing relevant third-party data. If you lack access to device IDs, then the analytics data you have provides a good jumping off point to learn about the audience already visiting your website. If you already have device IDs, when coupled with third party data, the analytics from your website can become a powerful means of supercharging the touchpoints you’ve discovered. But regardless of where you start in the virtuous circle, the value of tying event data to web analytics only boosts the likelihood of a successful engagement because it adds behavior to the event. For example, a device ID can tell you if the person you’re targeting works in financial services, and the related touchpoints can tell you when to reach them. When you add website behavior data to the mix, you shine a light on what they’re in the market for and where they are in the customer journey. Furthermore, in a world increasingly driven by programmatic media buys, the context of audience engagement may not be a B2B website. In fact, it’s more than likely that the best target for your ad will be to reach its target on Facebook, or their favorite consumer news site. As promised, let’s return to the geo-fence. For most B2B marketers, the operative word is “fence.” A fence conjures up an image of a captive audience, one that marketers can bombard with messages when they enter the perimeter. But another way to think of digital fence is as a set of coordinates for a grid representing the GPS boundaries of any relevant location. Yes, you can use a location as the immediate target for your message, but you can also choose to see the grid as a hub that reaches out to qualified prospects from every direction. The key thing to remember is that event targeting, beginning at the hub, works best when you’re committed to locating as many relevant universal IDs as possible, and branching out to see where those IDs take you. Once you’ve collected a universal ID, you can begin targeting immediately at the event location. You can also take that information and go in another direction by linking the universal ID back to your CRM, sales automation system through a physical address, or an email address. From a technology standpoint, the linking is a big data reverse engineering process to segment your audience into a set of assets. But from a marketing standpoint, what you’re doing is making your prospect both tangible and actionable. Marketers who are able to translate universal IDs into CRM records, email, and physical addresses stand an excellent chance of boosting their results in the sales funnel. For example, it’s certainly possible (and advisable) to leverage the multi-channel asset of a universal ID by supporting call-center activity, direct mail, and email with programmatic online media buys as “air cover” to every other sales investment. Coming full circle, or deploying multiple channel options at the same time while in the virtuous circle, improves response rates in every channel—that’s the beauty of the role of the universal ID within the virtuous circle. Ray Kingman has been at Semcasting, Inc. since its inception, leading the company in the development and commercialization of its automated targeting and data offerings. As an experienced innovator in content management, analytics and data visualization fields, Ray directs the day-to-day operations of Semcasting, Inc. Prior to Semcasting, Inc., Ray led teams at LightSpeed Software, DeltaPoint, Inc., and a division of Thomson Reuters.